It's funny what things can really make you happy when you're far away from "home." Sure, we're "at home" here, but there are little things from the US that mean so much more when you're able to have them on the other side of the world. Culturally-specific items are often impossible to get here, so you have to plan far in advance and bring them back with you in your suitcase. Last August we were SO happy when Bath and Body Works ended up rolling out its Halloween line right before we packed up for the year! We were actually able to get some fun goodies... We already had a jack-o-lantern hand soap pump that we refill each year, but we got some other great little candle holders and mini hand sanitizers. The Slatkin (Bath and Body Works) and Yankee Candles we have in seasonal scents also make me so happy... Creamy Pumpkin... Spiced Cider... LOVE the scents coming up for Christmas—but I use them sparingly, since each candle weighs over a pound. 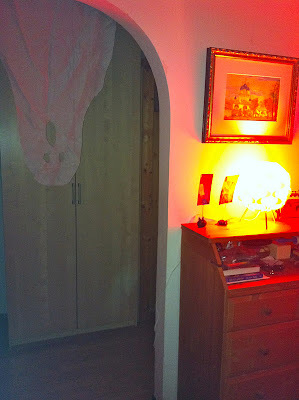 Here are some scenes from our apartment, lit up at night... There are our new candle holders—a Frankenstein and a skull. We also bought a pumpkin and a black cat. The pumpkin broke in transit, but we're happy to have the other three. 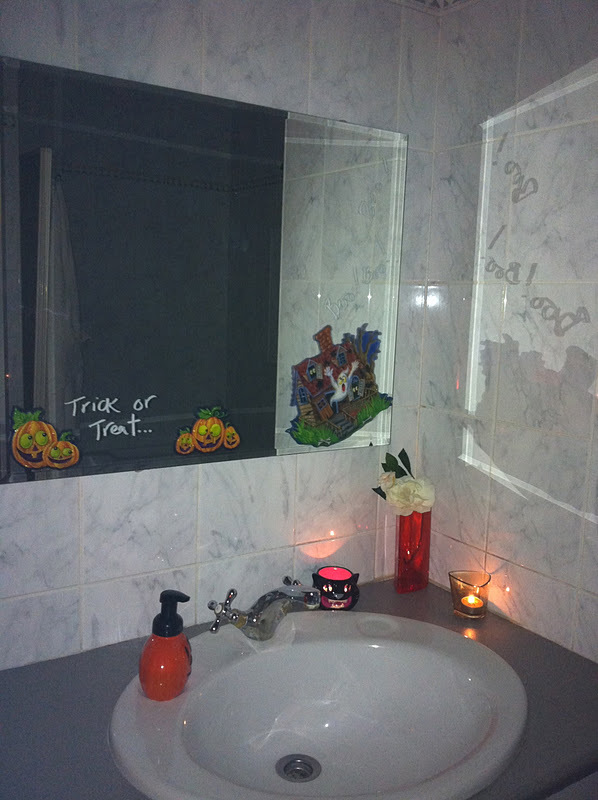 And some decals on the bathroom window, along with the jack-o-lantern soap, the black cat candle holder, and an orange bathmat & hand towel. There's nothing else really going on for us for Halloween this year, so the kids get into the decorations. We might have some people over and I brought back American candy. We might, however, actually have to/get to fly to the US next weekend for the week because we're required to be on US soil to get our new visas... No news about whether or not we'll be given the necessary work documents by the government yet, though, so we're just waiting on pins and needles... Sure would be fun to actually get to go trick or treating in America! Oh, I do hope you will get here for Halloween. I am sure girls will love it. My mom never decorated for holidays much at all, and somehow I inherited that character trait. You make me feel guilty! I decorated for holidays when she was growing up but don't any longer as my dog doesn't appreciate it. I didn't have much for Halloween though. Tami - The apt. looks great with all the decorations. Did you get the gel windows decorations? They were in the mailer (I think) that I sent the end of August via USPO and needs to be picked up. So excited that you and the girls will be here with me for Halloween so the girls can go trick or treating. It's a first as I've never spent Halloween with them. I'll actually have real Halloween pages to scrap.